"One of the principal buildings in the Old Town of Edinburgh is St. Giles' Church, an edifice of ancient Gothic style, and remarkable for its square tower, from which ascend four arches intersecting each other in the form of an imperial crown, and surmounted by a spire rising to an elevation of 161 feet. Another is the City Chambers, which, looking from the opposite corner of Princes Street Gardens, present a truly magnificent appearance, overlooking all the houses in that neighbourhood. 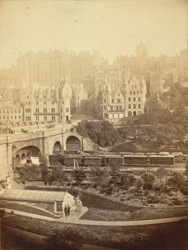 Crossing Waverley Bridge, below which is the Termini of the Railways, a fine street connects Princes Street of the New Town with High Street of the Old, having at its entrance a first-class Hotel, appearing in the foreground of this view."